Quiet Place-- The Sop or the Savior? THE SOP OR THE SAVIOR? On this page we will discuss the many "good things" which can come between you and Jesus Christ. John 13:21 (KJV) When Jesus had thus said, he was troubled in spirit, and testified, and said, Verily, verily, I say unto you, that one of you shall betray me. Verse 21-- Jesus sets the scene for our lesson, and the lines of loyalty are set also. Judas may have begun to follow Jesus three years previously with sincere desire to be eternally devoted to Messiah. But, something has changed inside the man. Verse 22-- No one suspected Judas was a traitor at heart. There are those amongst us who have followed close to Jesus for many years, they have manifest the power of God in serving others, and they have been entrusted by Christ, it would seem, with the gifts of ministry. We must not worry ourselves about this. Until it is openly known that someone is a traitor, we must accept all men who manifest the power of God, and let Christ decide when and how to reveal their wickedness. Verse 23-- John speaks of himself in the third person. He was leaning on Jesus' bosom. The meal was important, the Passover was important, the law must be fulfilled in the annual meal, and it is all right to be hungry and partake of what God provides. But, the center of John's attention was on Jesus himself. Verse 24-- Good old Peter. He is our curious brother, always wanting to get to the bottom of the matter. I don't think this was a Gestapo thing with Peter. Peter knew he was a wicked man and had asked Jesus to depart from him long ago. It may well be that Peter was in terror of his own frail humanity. It also may be that Peter wanted to "church" or excommunicate the rascal, whoever he was. Verse 25-- It seems that John had the nerve to ask what everyone wanted to know. Perhaps he too dreaded the thought that he might betray Jesus. Perhaps this moment explains why John went into the judgment hall later with Jesus and all the way to the cross. John represented the alternative to the choice about to be made by Judas. Verse 26-- The sop. It was good for food. It was given to Judas by Jesus. 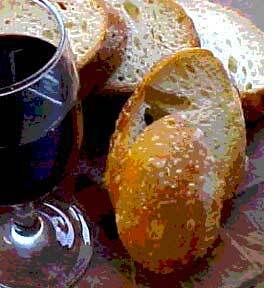 It was unleavened, Kosher, and part of the sacred meal of Israel. There was nothing evil about the sop. But, we see the choice here of two men, John and Judas. John had enjoyed the food, but his preference now was to be as close as possible to Jesus. Judas was still ready to satisfy his appetite, and he was eager to take, both silver, and food. Judas had forgotten the words of Job. Verse 27-- The lessons here are multiple. John got close to Jesus. He got close enough to have a personal communication with God and receive an answer. Judas was only close enough to satisfy his hunger. Leaning on Jesus-- close to the Shepherd-- waiting for the Word, OR close to the sop, waiting for the hand of plenty, ready to leave once the stomach was full. Eyes on Jesus-- talking to Jesus-- listening to Peter-- wanting to know, OR watching the last choice sop-- wishing for more kids on the church bus-- yearning for a bigger offering-- not listening-- not asking-- not even hearing the question of the saints around you. Song of Solomon 8:5 (KJV) Who is this that cometh up from the wilderness, leaning upon her beloved? I raised thee up under the apple tree: there thy mother brought thee forth: there she brought thee forth that bare thee. Prophecy, when based in the Word of God, is good for the soul. It helps the saint keep a forward look, it gives assurance to see prophecy fulfilled, but it does not convict of sin nearly as well as leaning on Jesus. That is why many allegedly Fundamental churches love prophecy conferences. Let me show you how your sop of prophecy could fail you. All Fundamental prophecy teachers and books exalt the Lord for bringing Israel back into the land. But, what if 1948 is not the true fulfillment of prophecy about the return of Israel and it becoming a nation? My Dad always cautioned us not to make the present state of Israel the absolute fulfillment of the return. It sure looks like it, but tell me, what if the Arabs drove the Jews out of Israel next week, and what if they had to flee again to Europe or the USA? Would you lose your assurance of salvation. You see, prophecy is a good sop, right from the hand of Jesus, but it is not the foundation of your assurance. Jesus Christ in person is supposed to be sufficient for you to lean on until you die or he comes back for you. The Holy Ghost is our "Earnest," not Israel. Repentance is becoming a fetish to Fundamentalists. The fact that you repented long ago "at an old fashioned altar" is not enough to make it through to heaven. If you do not believe "and are sure" that Jesus is the Christ, the Son of the Living God, you are damned to hell, and your repentance be damned with you. Hindus repent, pagans repent, Catholics repent, and they are hell bound. It is JESUS in person who is the object of your salvation and assurance. Are you clinging to the sop of repentance. It is a good sop, it is part of being converted, and it comes to you from Jesus, but it is Jesus who saved you, not your repentance. Some men bury themselves in study of the Word of God. This is a sop with promise, for we are told that if we study the Word, we will become "throughly furnished unto all good works." Now, you should enjoy that sop, but have you become a servant of study, of scholarship. Do you see a sermon every time you read the Word? Or, do you sometimes read, think, meditate, and lean on Jesus, for he IS the Word. When you die, trust me, anyone who counts to God and you now will not rustle up all your sermon notes and pour over them. There is nothing more moldy and stale as another man's sermon notes. So, how about setting down the sop once in a while and just lean on Jesus? You are a member in the Body of Christ, if you have confessed your faith in Jesus Christ before man, and he has entered your name in the Lamb's Book of Life. Where else do you suppose you need to be a member? The local church is no better off for its membership list, in fact, there is possibly no greater offense to Christian fellowship than lists. Are you a member of a preacher's club? What did that get you. This is a sop from Satan, not Jesus Christ, but it needs treatment here. If someone will not take you as you are, after confessing Jesus Christ to them, they are sucking on a Satanic sop. Do not let this happen to you. There is not ONE verse of Scripture to justify making lists of anyone in Christ's Church. Men should see your good works and glorify you Father which is in heaven, right? Certainly! Jesus also said you would do greater things than he had done. Does that not justify being totally immersed in good works. NO! Thousands of saints are totally distracted from leaning on Jesus, they are exhausted, and they are dry as the top rail of the fence all the time. They have quit leaning on Jesus and are totally preoccupied with the sop of works. Get back to the Savior of your works, and you will be amazed at how much you get done for him with half the effort. Here is a sop that is mocked by Fundamentalists universally. The Reformed churches all have creeds, and much debate, study, and throbbing of effulgent brains, in halls of academic glory, goes into the fine tuning of creeds. Now, I want to be fair here. History tells us a story that Fundamentalists ignore as they stand on the shoulders of the Reformers and mock. When Martin Luther nailed his thesis to the chapel door, there was not a Bible in town for the neophyte followers of Christ to read. There were street plays, which had totally warped the Truth, and there were minstrels, who botched every thing they sang about from the Bible. Brother Gutenberg had just invented the printing press, and when Bibles were finally printed they were chained to the pulpit so they would not be stolen. So, Luther, Zwingli, Calvin, and the other Reformers all sat down and composed creeds. These were short enough to memorize and repeat in church worship times, and eventually, the converts of the Reformation could tell you what they believed. Old Mother Whore from Rome had no such creed. The Pope and priests gave their people noting final, only terror and threats and works. But, along came Tyndale who said he wanted every plowman to have a Bible. Soon, Bibles were being printed in enough quantities that a man of means could afford one and hold a Bible study in his home. Many years later, Bibles were everywhere, and today, no Reformed Christian has an excuse for letting the sop of a creed define his faith. If you have a Bible, use it to lean on Jesus, and if you do not have a Bible, go to Wal-Mart and buy one for $5. Stop chanting and burping up stale sop every Sunday morning. There is warfare in the Christian life, it comes directly from Jesus Christ, is commanded, and is rewarded. We lay heavy emphasis on spiritual warfare at this journal. But, it is possible to get to the point where battle is all you want. Kicking the Pope is all the spiritual exercise you care for. Christian warfare is a sop from Jesus Christ, and it is good for the soul. But, you can so easily become such a warrior that you no longer stop and lean on Jesus. Psalms 19:1 (KJV) The heavens declare the glory of God; and the firmament sheweth his handywork. Do you take your eyes off of the battle regularly and lean on Jesus? So, you had Rick Warren around to show you how to grow a local church? Or, did you have some Fundamental Baptist famous Amos like Lee Roberson or some Hyles clone come around and fire up your church to mighty deeds of "bring them in"? Tell me, preacher, when is the last time you called a man in to do a series of meetings to help saints lean on Jesus. I don't mean one of your mongrel Charles Finney "Revival Meetings." I mean a quiet, contemplative, tender time with the Good Shepherd, just wandering around the green pastures and by the still waters with the Lord. I am totally grossed out by the hype and hurrahs of you boys who think the saints are worthless unless they are in a frenzy of activity. Face it, you do not really want the saints to lean on Jesus. If you did, you would preach on Jesus Christ and his life AND the Gospel more, and the Epistles and the typology of the tabernacle and the knops of the temple less. Go figure. Who leans on Jesus at your church house-- do YOU lean on Jesus in your pulpit? And as for Rich Warren and Purpose Driven Cheese, and the Emerging Church (where has it been for 2000 years), and Contemplative Prayer, these are gold plated dandy counterfeits for, "Draw me nearer, nearer blessed Lord...." Get that high tension sop out of your mouth and ask Jesus, "Lord, is it I?" Charismatic Christians have bought into the notion that the power of God has to fall in some spectacular way every Sunday at the front of the church. A church near us had a sign on the front that said, "Miracles every service." They closed up for good several weeks ago. They were craving the sop. This is a sop from Jesus Christ again, at least sometimes. It is good for food, and it can be a blessing. But, millions of Christians around the world will NOT set the sop down and get over yonder on the other side of the table and just lean on Jesus. He might just sit there and hug them, and then the gold dust might not fall from the clouds, and they might have to shut up and stop chattering in alleged tongues and, heaven forbid, LISTEN! Oh, you self-righteous Baptists, you do the same thing with you hyper services that have not one vestige of worship, no quietness, and not time to lean on Jesus. You joke and carry on like Jesus went on vacation, and you need to keep the mob amused at all costs. Put that ego driven sop down, and lean on Jesus next Sunday morning. Is it good to provide for your own, like maybe your kids' education? Is it good to do good works in the community, like help some local God fearing man get elected? Is this a sop from Jesus? Well, I gather it could be, for we are to be salt for sure. But, some of you are so obsessed with saving America, or the UK, or Canada, or some other nation, that you do not have time to lean on Jesus. You have come to be so consumed with the terror of a naughty lady like Hillary Clinton getting into office that Jesus Christ has been voted out of the Lordship of your life by default. You just do not have time to lean on Jesus until the battle is over, AND it never is over, right? You are wicked. Hillary Clinton is destroying your fellowship with Jesus Christ. Fighting for the rights of home schoolers has been used of Satan to make your spiritual IQ about Jesus Christ well below 60. Put that sop down, that worthy sop, that rewarding sop, and go give the giver of the sop a big hug once in a while, AND hang around-- you will learn something about the battle. forsaketh not all that he hath, he cannot be my disciple. Is it time you left your preoccupation with the sop and leaned on the Savior of the sop? "John 11:36 (KJV) Then said the Jews, Behold how he loved him!" "He sure was a great Bible scholar." "He built the biggest Sunday School in the South." "He was the greatest prophecy teacher I ever heard." "I never knew a preacher with a bigger library than his." "He sure gave the devil a hard time in his city." "He sure could eat fried chicken." "My, my, how he loved that sop." Thousands of Christians are now reading Zola Levitt more than they are reading their Bible. Satan can enter such Christians quite easily. Read the comments of the man who followed Zola Levitt. This man has made a sop of Zola. This is not to say the Zola was evil, indeed, God may have considered Zola a useful servant, but this man is leaning on Zola far too much. heart: and ye shall find rest unto your souls.